Core recovery program just one more way to help the environment, improve quality, and save money. The Ford Motor Company has recently expanded its Core Recovery Program to include bumpers and headlamp assemblies. Ford claims this significantly reduces the amount of material being recycled. 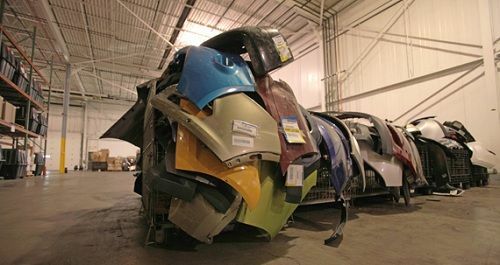 Ford has for many decades maintained a parts remanufacturing and recycling program, as do all manufacturers, however though this expansion it is focusing on hard to recycle materials. In its press release Ford claims to have prevented about 120 million pounds of material from being placed in landfills. We will take Ford at its word for that claim, but it begs the question “where these notorious landfills are, and why they are still in use?” Many groups and companies like to weigh things in terms of “kept from a landfill”, but the reality is that most communities no longer employ landfills. In fact, electricity generated from burning trash is considered clean and renewable energy. At cogeneration plants thermoset plastics (which cannot be melted and reused) can be fed directly to the furnace, while the community can separate out thermoplastic materials (those plastics that can be remelted and reformed) prior to delivery to the energy plant. Furthermore, metals can be easily pulled out from the cogen plants and recycled both pre and post furnace. Ford points out that there were three main reasons why it updated its Core Recovery Program; Cost, Quality, and Environmental Issues. Cost is the interesting reason. Apparently, Ford had multiple localized programs in place that were overlapping and in some cases creating gaps in the network, so by aligning them all under one program there were gains in efficiency. Second, quality makes perfect sense, since by managing the remanufacture to its own high standards Ford helps to cut out third party remanufacture of critical components. There is no doubt that environmental consciousness played a role here, but was it Ford’s intention to change the way these parts were re-used, or by managing the program does it now count the parts involved as “saved from a landfill” regardless of how they would have been re-used, remanufactured, or recycled had Ford not been involved. Credit Ford for taking ownership of a large, and important part of automotive repair.